The Contest committee is enormously pleased and honored to introduce the two judges for this year’s Contest: Maria McLeod and Stan Tag. Maria McLeod, principal and partner of How Loud Media, is a media specialist. She uses her skills as an in-depth interviewer and creative director to produce documentaries, oral histories, biographies and executive profiles. As a media specialist, she also produces multimedia projects and dynamic marketing materials for businesses and nonprofits. McLeod received a bachelor’s degree in Written Professional Communications, Public Relations and a Master of Fine Arts in Creative Writing, Poetry. In 2008, she participated in the Documentary Video Certification program through Western Washington University. She also has served as an instructor and academic administrator for leading institutions of higher learning, including Western Washington University, the University of Pittsburgh and Bennington College. In addition to her professional writing life, McLeod writes and publishes poetry and short fiction. Her honors include three Pushcart Prize nominations and the Indiana Review Poetry Prize. Stan Tag lived his earliest years near the confluences of the Blackfoot, the Clark Fork and the Bitterroot Rivers, in a valley ringed with mountains marked by a succession of ancient lakeshores. He spent his youth living on the urban edges of the fire-charred, mud-sliding, smog-filled, dry and verdant hills of northeast L.A. He explored creative writing and literature at Whitworth College under a canopy of ponderosa pines. At the University of Iowa, Stan studied American literature and culture and completed a dissertation on 19th-century Maine Woods narratives. Before coming to Fairhaven College in 1997, he taught at St. Olaf College and Albertson College. Stan enjoys living on the edge of Sehome Hill, a short walk from the bay, in the shadow and watchful snowy eye of a volcano. At Fairhaven he teaches courses in American literature and culture, poetry, creative writing, punctuation, natural history, animal studies, maps and walking. Huge thanks to Jeremy Voigt and Nancy Lou Canyon for so capably and enjoyably leading yesterday’s poetry workshops! Two more poetry workshops coming up on Saturday, February 26: Lana Hechtman Ayers on Persona Poems and Rena Priest on Ecstatic Poems. Don’t miss ’em. Details on the Events page. Are you a fan of poetry in Whatcom County? in the kitchen at Ciao Thyme. In addition to sensational food and great company, our guest poet/reader will be multi-talented, engaging, amusing Kevin Murphy, cast member of the Chuckanut Radio Hour and author of A Beautiful Chaos Demands Energy. Have a look at Kevin’s recent profile in the Bellingham Herald. I can almost see them grow. *Copyright 2009 by Esme Dutcher. This poem appears in POETRY WALK: Sue C. Boynton Poetry Contest – The First Five Years. Info: Book! Placard design by Egress Studio. 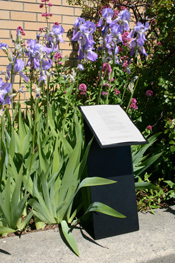 The poems submitted to last year’s contest on display at the 2010 awards ceremony. Hey poets (or poets-to-be)! We still have a couple of seats open for the two poetry workshops this Saturday, January 29. All the details are here, so have a look and sign up now. Your participation benefits you, your poetry AND the Sue Boynton Poetry Contest! *Copyright 2010 by Luke Reinschmidt. This poem, which can also be read here, appears in POETRY WALK: Sue C. Boynton Poetry Contest – The First Five Years. Info: Book! Placard design by Egress Studio.